"Haghia Sophia" redirects here. For the steamship known by that name, see SS Sussex. For other uses, see Hagia Sophia (disambiguation). Hagia Sophia (/ˈhɑːɡiə soʊˈfiːə/; from the Greek Αγία Σοφία, pronounced [aˈʝia soˈfia], "Holy Wisdom"; Latin: Sancta Sophia or Sancta Sapientia; Turkish: Ayasofya) is the former Greek Orthodox Christian patriarchal cathedral, later an Ottoman imperial mosque and now a museum (Ayasofya Müzesi) in Istanbul, Turkey. Built in 537 AD at the beginning of the Middle Ages, it was famous in particular for its massive dome. It was the world's largest building and an engineering marvel of its time. It is considered the epitome of Byzantine architecture and is said to have "changed the history of architecture". The Hagia Sophia construction consists of mostly masonry. The structure is composed of brick and mortar joints that are 1.5 times the width of the bricks. The mortar joints are composed of a combination of sand and minute ceramic pieces displaced very evenly throughout the mortar joints. This combination of sand and ceramic pieces could be considered to be the equivalent of modern concrete at the time. From the date of its construction's completion in 537 until 1453, it served as an Eastern Orthodox cathedral and the seat of the Ecumenical Patriarch of Constantinople, except between 1204 and 1261, when it was converted by the Fourth Crusaders to a Roman Catholic cathedral under the Latin Empire. The building was later converted into an Ottoman mosque from 29 May 1453 until 1931. It was then secularized and opened as a museum on 1 February 1935. It remained the world's largest cathedral for nearly a thousand years, until Seville Cathedral was completed in 1520. The current building was originally constructed as a church between 532 and 537 on the orders of the Byzantine Emperor Justinian I and was the third Church of the Holy Wisdom to occupy the site, the prior one having been destroyed by rioters in the Nika Revolt. It was designed by the Greek geometers Isidore of Miletus and Anthemius of Tralles. The church was dedicated to the Wisdom of God, the Logos, the second person of the Trinity, its patronal feast taking place on 25 December, the commemoration of the birth of the incarnation of the Logos in Christ. Although sometimes referred to as Sancta Sophia (as though it were named after Sophia the Martyr), sophia being the phonetic spelling in Latin of the Greek word for wisdom, its full name in Greek is Ναός της Αγίας του Θεού Σοφίας, Naos tēs Hagias tou Theou Sophias, "Shrine of the Holy Wisdom of God". The church contained a large collection of relics and featured, among other things, a 15-metre (49 ft) silver iconostasis. The focal point of the Eastern Orthodox Church for nearly one thousand years, the building witnessed the excommunication of Patriarch Michael I Cerularius officially communicated by Humbert of Silva Candida, the papal envoy of Pope Leo IX in 1054, an act that is commonly considered the start of the East–West Schism. In 1453, Constantinople was conquered by the Ottoman Empire under Mehmed the Conqueror, who ordered this main church of Orthodox Christianity converted into a mosque. Although some parts of the city of Constantinople were falling into disrepair, the cathedral was maintained with an amount of money set aside for this purpose. Nevertheless, the Christian cathedral made a strong impression on the new Ottoman rulers and they decided to convert it into a mosque. The bells, altar, iconostasis, and other relics were destroyed and the mosaics depicting Jesus, his Mother Mary, Christian saints, and angels were also destroyed or plastered over. Islamic features – such as the mihrab (a niche in the wall indicating the direction toward Mecca, for prayer), minbar (pulpit), and four minarets – were added. It remained a mosque until 1931 when it was closed to the public for four years. It was re-opened in 1935 as a museum by the Republic of Turkey. Hagia Sophia was, as of 2014[update], the second-most visited museum in Turkey, attracting almost 3.3 million visitors annually. According to data released by the Turkish Culture and Tourism Ministry, Hagia Sophia was Turkey's most visited tourist attraction in 2015. On 24 March 2019, the President of Turkey Recep Tayyip Erdoğan said that the Hagia Sophia might be reverted to a mosque. The first church on the site was known as the Μεγάλη Ἐκκλησία (Megálē Ekklēsíā, "Great Church"), or in Latin Magna Ecclesia, because of its larger dimensions in comparison to the contemporary churches in the City. Inaugurated on 15 February 360 (during the reign of Constantius II) by the Arian bishop Eudoxius of Antioch, it was built next to the area where the imperial palace was being developed. The nearby Hagia Eirene ("Holy Peace") church was completed earlier and served as cathedral until the Great Church was completed. Both churches acted together as the principal churches of the Byzantine Empire. Writing in 440, Socrates of Constantinople claimed that the church was built by Constantius II, who was working on it in 346. A tradition which is not older than the 7th or 8th century, reports that the edifice was built by Constantine the Great. Zonaras reconciles the two opinions, writing that Constantius had repaired the edifice consecrated by Eusebius of Nicomedia, after it had collapsed. Since Eusebius was bishop of Constantinople from 339 to 341, and Constantine died in 337, it seems possible that the first church was erected by the latter. The edifice was built as a traditional Latin colonnaded basilica with galleries and a wooden roof. It was preceded by an atrium. It was claimed to be one of the world's most outstanding monuments at the time. A second church on the site was ordered by Theodosius II, who inaugurated it on 10 October 415. The basilica with a wooden roof was built by architect Rufinus. A fire started during the tumult of the Nika Revolt and burned the second Hagia Sophia to the ground on 13–14 January 532. Several marble blocks from the second church survive to the present; among them are reliefs depicting 12 lambs representing the 12 apostles. Originally part of a monumental front entrance, they now reside in an excavation pit adjacent to the museum's entrance after they were discovered in 1935 beneath the western courtyard by A.M. Schneider. Further digging was forsaken for fear of impinging on the integrity of the building. On 23 February 532, only a few weeks after the destruction of the second basilica, Emperor Justinian I decided to build a third and entirely different basilica, larger and more majestic than its predecessors. Justinian chose geometer and engineer Isidore of Miletus and mathematician Anthemius of Tralles as architects; Anthemius, however, died within the first year of the endeavor. The construction is described in the Byzantine historian Procopius' On Buildings (Peri ktismatōn, Latin: De aedificiis). Columns and other marbles were brought from all over the empire, throughout the Mediterranean. The idea of these columns being spoils from cities such as Rome and Ephesus is a later invention. Even though they were made specifically for Hagia Sophia, the columns show variations in size. More than ten thousand people were employed. This new church was contemporaneously recognized as a major work of architecture. The theories of Heron of Alexandria may have been utilized to address the challenges presented by building such an expansive dome over so large a space. The emperor, together with the Patriarch Menas, inaugurated the new basilica on 27 December 537 – 5 years and 10 months after construction start – with much pomp. The mosaics inside the church were, however, only completed under the reign of Emperor Justin II (565–578). Hagia Sophia was the seat of the Orthodox patriarch of Constantinople and a principal setting for Byzantine imperial ceremonies, such as coronations. Like other churches throughout Christendom, the basilica offered sanctuary from persecution to outlaws. Earthquakes in August 553 and on 14 December 557 caused cracks in the main dome and eastern half-dome. The main dome collapsed completely during a subsequent earthquake on 7 May 558, destroying the ambon, altar, and ciborium. The collapse was due mainly to the unfeasibly high bearing load and to the enormous shear load of the dome, which was too flat. These caused the deformation of the piers which sustained the dome. The emperor ordered an immediate restoration. He entrusted it to Isidorus the Younger, nephew of Isidore of Miletus, who used lighter materials and elevated the dome by "30 feet" (about 6.25 meters or 20.5 feet)[clarification needed] – giving the building its current interior height of 55.6 meters (182 ft). Moreover, Isidorus changed the dome type, erecting a ribbed dome with pendentives, whose diameter lay between 32.7 and 33.5 m. Under Justinian's orders, eight Corinthian columns were disassembled from Baalbek, Lebanon, and shipped to Constantinople around 560. This reconstruction, giving the church its present 6th-century form, was completed in 562. The Byzantine poet Paul the Silentiary composed a long epic poem (still extant), known as Ekphrasis, for the rededication of the basilica presided over by Patriarch Eutychius on 23 December 562. In 726, the emperor Leo the Isaurian issued a series of edicts against the veneration of images, ordering the army to destroy all icons – ushering in the period of Byzantine iconoclasm. At that time, all religious pictures and statues were removed from the Hagia Sophia. After a brief reprieve under Empress Irene (797–802), the iconoclasts made a comeback. The Emperor Theophilus (829–842) had two-winged bronze doors with his monograms installed at the southern entrance of the church. The basilica suffered damage, first in a great fire in 859, and again in an earthquake on 8 January 869, that made one of the half-domes collapse. Emperor Basil I ordered the church repaired. After the great earthquake of 25 October 989, which collapsed the Western dome arch, Emperor Basil II asked for the Armenian architect Trdat, creator of the cathedrals of Ani and Argina, to direct the repairs. He erected again and reinforced the fallen dome arch, and rebuilt the west side of the dome with 15 dome ribs. The extent of the damage required six years of repair and reconstruction; the church was re-opened on 13 May 994. At the end of the reconstruction, the church's decorations were renovated, including the addition of four immense paintings of cherubs; a new depiction of Christ on the dome; a burial cloth of Christ shown on Fridays, and on the apse a new depiction of the Virgin Mary holding Jesus, between the apostles Peter and Paul. On the great side arches were painted the prophets and the teachers of the church. In his book De caerimoniis aulae Byzantinae ("Book of Ceremonies"), Emperor Constantine VII (913–919) wrote a detailed account of the ceremonies held in the Hagia Sophia by the emperor and the patriarch. Upon the capture of Constantinople during the Fourth Crusade, the church was ransacked and desecrated by the Crusaders, as described by the Byzantine historian Niketas Choniates. During the Latin occupation of Constantinople (1204–1261) the church became a Roman Catholic cathedral. Baldwin I of Constantinople was crowned emperor on 16 May 1204 in Hagia Sophia, at a ceremony which closely followed Byzantine practices. Enrico Dandolo, the Doge of Venice who commanded the sack and invasion of the city by the Latin Crusaders in 1204, is buried inside the church, probably in the upper Eastern gallery. In the 19th century, an Italian restoration team placed a cenotaph marker near the probable location, which is still visible today. The marker is frequently mistaken by tourists as being a medieval marker of the actual tomb of the doge. The real tomb was destroyed by the Ottomans after the conquest of Constantinople in 1453 and subsequent conversion of Hagia Sophia into a mosque. After the recapture in 1261 by the Byzantines, the church was in a dilapidated state. In 1317, emperor Andronicus II ordered four new buttresses (Pyramídas, Greek: "Πυραμίδας") to be built in the eastern and northern parts of the church, financing them with the inheritance of his deceased wife, Irene. New cracks developed in the dome after the earthquake of October 1344, and several parts of the building collapsed on 19 May 1346; consequently, the church was closed until 1354, when repairs were undertaken by architects Astras and Peralta. Constantinople fell to the attacking Ottoman forces on the 29th of May in 1453. In accordance with the traditional custom at the time, Sultan Mehmet II allowed his troops and his entourage three full days of unbridled pillage and looting in the city shortly after it was captured. Once the three days passed, he would then claim its remaining contents for himself. Hagia Sophia was not exempted from the pillage and looting and specifically became its focal point as the invaders believed it to contain the greatest treasures and valuables of the city. Shortly after Constantinople's defenses collapsed and the Ottoman troops entered the city victoriously, the pillagers and looters made their way to the Hagia Sophia and battered down its doors before storming in. All throughout the period of the siege of Constantinople, the trapped worshippers of the city participated in the Divine Liturgy and the Prayer of the Hours at the Hagia Sophia and the church formed a safe-haven and a refuge for many of those who were unable to contribute to the city's defense, which comprised women, children, the elderly and the sick and the wounded. Being hopelessly trapped in the church, the many congregants and yet more refugees inside became spoils-of-war to be divided amongst the triumphant invaders. The building was significantly desecrated and looted to a large extent, with the helpless occupants who sought shelter within the church being either enslaved, physically and sexually violated or simply slaughtered. While most of the elderly and the infirm/wounded and sick were killed, a vast number of women and girls were raped and the remainder (mainly teenage males and young boys) were chained up and sold off into slavery. The church's priests and religious personnel continued to perform Christian rites, prayers and ceremonies until finally being forced to stop by the invaders. When Sultan Mehmet II and his accompanying entourage entered the church, he insisted that it should be converted into a mosque at once. One of the ulama (Islamic scholars) present then climbed up the church's pulpit and recited out the Shahada ("There is no God but Allah, and Mohammed is His prophet"), thus marking the beginning of the gradual conversion of the church into a mosque. As described by several Western visitors (such as the Córdoban nobleman Pero Tafur and the Florentine Cristoforo Buondelmonti), the church was in a dilapidated state, with several of its doors fallen from their hinges; Mehmed II ordered a renovation as well as the conversion. Mehmet attended the first Friday prayer in the mosque on 1 June 1453. Aya Sofya became the first imperial mosque of Istanbul. To the corresponding Waqf were endowed most of the existing houses in the city and the area of the future Topkapı Palace. From 1478, 2,360 shops, 1,300 houses, 4 caravanserais, 30 boza shops, and 23 shops of sheep heads and trotters gave their income to the foundation. Through the imperial charters of 1520 (AH 926) and 1547 (AH 954) shops and parts of the Grand Bazaar and other markets were added to the foundation. Before 1481 a small minaret was erected on the southwest corner of the building, above the stair tower. Later, the subsequent sultan, Bayezid II (1481–1512), built another minaret at the northeast corner. One of these collapsed after the earthquake of 1509, and around the middle of the 16th century they were both replaced by two diagonally opposite minarets built at the east and west corners of the edifice. In the 16th century the sultan Suleiman the Magnificent (1520–1566) brought back two colossal candlesticks from his conquest of Hungary. They were placed on either side of the mihrab. During the reign of Selim II (1566–1574), the building started showing signs of fatigue and was extensively strengthened with the addition of structural supports to its exterior by Ottoman architect Mimar Sinan, who was also an earthquake engineer. In addition to strengthening the historic Byzantine structure, Sinan built the two additional large minarets at the western end of the building, the original sultan's lodge and the Türbe (mausoleum) of Selim II to the southeast of the building in 1576–1577 / AH 984. In order to do that, parts of the Patriarchate at the south corner of the building were pulled down the previous year. Moreover, the golden crescent was mounted on the top of the dome, while a respect zone 35 arşin (about 24 m) wide was imposed around the building, pulling down all the houses which in the meantime had nested around it. Later his türbe hosted also 43 tombs of Ottoman princes. 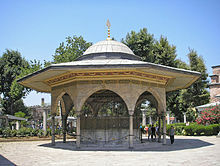 In 1594 / AH 1004 Mimar (court architect) Davud Ağa built the türbe of Murad III (1574–1595), where the Sultan and his Valide, Safiye Sultan were later buried. The octagonal mausoleum of their son Mehmed III (1595–1603) and his Valide was built next to it in 1608 / AH 1017 by royal architect Dalgiç Mehmet Aĝa. His son Mustafa I (1617–1618; 1622–1623) converted the baptistery into his türbe. Murad III had also two large alabaster Hellenistic urns transported from Pergamon and placed on two sides of the nave. In 1717, under Sultan Ahmed III (1703–1730), the crumbling plaster of the interior was renovated, contributing indirectly to the preservation of many mosaics, which otherwise would have been destroyed by mosque workers. In fact, it was usual for them to sell mosaics stones – believed to be talismans – to the visitors. Sultan Mahmud I ordered the restoration of the building in 1739 and added a medrese (a Koranic school, now the library of the museum), an Imaret (soup kitchen for distribution to the poor) and a library, and in 1740 a Şadirvan (fountain for ritual ablutions), thus transforming it into a külliye, i.e. a social complex. At the same time, a new sultan's lodge and a new mihrab were built inside. Restoration of the Hagia Sophia was ordered by Sultan Abdülmecid and completed by eight hundred workers between 1847 and 1849, under the supervision of the Swiss-Italian architect brothers Gaspare and Giuseppe Fossati. The brothers consolidated the dome and vaults, straightened the columns, and revised the decoration of the exterior and the interior of the building. The mosaics in the upper gallery were exposed and cleaned, although many were recovered "for protection against further damage". The old chandeliers were replaced by new pendant ones. New gigantic circular-framed disks or medallions were hung on columns. These were inscribed with the names of Allah, Muhammad, the first four caliphs Abu Bakr, Umar, Uthman and Ali, and the two grandchildren of Muhammad: Hassan and Hussain, by the calligrapher Kazasker Mustafa İzzed Effendi (1801–1877). In 1850 the architects Fossati built a new sultan's lodge or loge in a Neo-Byzantine style connected to the royal pavilion behind the mosque. They also renovated the minbar and mihrab. Outside the main building, the minarets were repaired and altered so that they were of equal height. A timekeeper's building and a new madrasah (Islamic school) were built. When the restoration was finished, the mosque was re-opened with ceremonial pomp on 13 July 1849. In 1935, the first Turkish President and founder of the Republic of Turkey, Mustafa Kemal Atatürk, transformed the building into a museum. The carpets were removed and marble floor decorations such as the Omphalion appeared for the first time in centuries, while the white plaster covering many of the mosaics was removed. Nevertheless, the condition of the structure deteriorated, and the World Monuments Fund placed Hagia Sophia on 1996 World Monuments Watch, and again in 1998. The building's copper roof had cracked, causing water to leak down over the fragile frescoes and mosaics. Moisture entered from below as well. Rising ground water had raised the level of humidity within the monument, creating an unstable environment for stone and paint. The WMF secured a series of grants from 1997 to 2002 for the restoration of the dome. The first stage of work involved the structural stabilization and repair of the cracked roof, which was undertaken with the participation of the Turkish Ministry of Culture. The second phase, the preservation of the dome's interior, afforded the opportunity to employ and train young Turkish conservators in the care of mosaics. By 2006, the WMF project was complete, though many other areas of Hagia Sophia continue to require significant stability improvement, restoration and conservation. Hagia Sophia is currently (2014) the second most visited museum in Turkey, attracting almost 3.3 million visitors annually. Although use of the complex as a place of worship (mosque or church) was strictly prohibited, in 2006 the Turkish government allowed the allocation of a small room in the museum complex to be used as a prayer room for Christian and Muslim museum staff, and since 2013 from the minarets of the museum the muezzin sings the call to prayer twice per day, in the afternoon. In 2007, Greek American politician Chris Spirou launched an international organization "Free Agia Sophia Council" championing the cause of restoring the building to its original function as a Christian church. Since the early 2010s, several campaigns and government high officials, notably Turkey's deputy prime minister Bülent Arınç in November 2013, have been demanding that Hagia Sophia be converted into a mosque again. In 2015, in retaliation for the acknowledgment by Pope Francis of the Armenian Genocide, the Mufti of Ankara, Mefail Hızlı, stated that he believes the conversion of Hagia Sophia into a mosque will be accelerated. On July 1, 2016, Muslim prayers were held again in the Hagia Sophia for the first time in 85 years. On May 13, 2017, a large group of people organized by the Anatolia Youth Association (AGD), gathered in front of Hagia Sophia and prayed the morning prayer with a call for the reconversion of the museum into a mosque. On June 21, 2017, Presidency of Religious Affairs (Diyanet) organized a special program, which included the recitation of the Quran and prayers in Hagia Sofia, to mark the Laylat al-Qadr, the program was broadcast live by state-run television TRT. In March 31, 2018, Turkish president Recep Tayyip Erdoğan recited the first verse of the Quran in the Hagia Sophia, dedicating the prayer to the "souls of all who left us this work as inheritance, especially Istanbul's conqueror," strengthening the political movement to make the Hagia Sophia a mosque once again, which would reverse Atatürk's measure of turning the Hagia Sophia into a secular museum. In March 2019, Erdoğan said that he will change the status of Hagia Sophia from a museum to a mosque, adding that it was a "very big mistake" to turn it into a museum. As a UNESCO World Heritage site, this change would require approval from UNESCO's World Heritage Committee. 360 – Inauguration of Hagia Sophia, under the rule of Constantius II. 404 – The original roof was destroyed in a fire. 415 – Hagia Sophia was restored and rededicated by Theodosius II. 532 – Hagia Sophia was burned down once again. The structure was completely destroyed alongside various other churches. After a mere 93 days, construction of the Hagia Sophia began. 553 – An earthquake shook Hagia Sophia, weakening the crown of Eastern arch. 558 – Another earthquake hit, causing a break between the two halves. A few months after, the main dome collapsed alongside the eastern semidome. This caused the destruction of the ambo, ciborium, and the Holy Table. 562 – Reconstruction was completed. 726 – Hagia Sophia was stripped of religious illustrations and sculptural work. 842 – St Sophia was finally re-installed. Commencing the redecoration of Hagia Sophia. 859 – A great fire damaged the Hagia Sophia. 869 – An earthquake caused a half dome to collapse. 989 – Another massive earthquake caused the collapse of the western dome. 994 – Hagia Sophia was reopened after reconstruction took place. 1204 – Hagia Sophia became a Roman Catholic Cathedral. 1261 – Hagia Sophia was converted to an Orthodox Church again. 1346 – Various parts of the building collapsed and the church was closed. 1354 – Hagia Sophia reopened after construction. 1453 – Following the fall of Constantinople, Mehmed the Conqueror orders the conversion of Hagia Sophia into a mosque. Τhe Divine Service in Hagia Sophia at the time of the Salvation was interrupted. 1573 – The exterior was significantly strengthened and altered to follow the customary mosque appearance. 1717 – Renovations on the interior began. 1734 – Hagia Sophia had additions to restorations, such as the building of a library and a Quranic School. 1849 – the mosque was reopened. 1919 – Τhe Divine Service in Hagia Sophia, which had been interrupted after the Salvation in 1453, was continued and completed by a Greek military priest. Hagia Sophia is one of the greatest surviving examples of Byzantine architecture. Its interior is decorated with mosaics and marble pillars and coverings of great artistic value. The temple itself was so richly and artistically decorated that Justinian proclaimed, "Solomon, I have outdone thee!" (Νενίκηκά σε Σολομών). Justinian himself had overseen the completion of the greatest cathedral ever built up to that time, and it was to remain the largest cathedral for 1,000 years up until the completion of the cathedral in Seville in Spain. Justinian's basilica was at once the culminating architectural achievement of late antiquity and the first masterpiece of Byzantine architecture. Its influence, both architecturally and liturgically, was widespread and enduring in the Eastern Orthodox, Roman Catholic, and Muslim worlds alike. The vast interior has a complex structure. The nave is covered by a central dome which at its maximum is 55.6 m (182 ft 5 in) from floor level and rests on an arcade of 40 arched windows. Repairs to its structure have left the dome somewhat elliptical, with the diameter varying between 31.24 and 30.86 m (102 ft 6 in and 101 ft 3 in). At the western entrance side and eastern liturgical side, there are arched openings extended by half domes of identical diameter to the central dome, carried on smaller semi-domed exedras; a hierarchy of dome-headed elements built up to create a vast oblong interior crowned by the central dome, with a clear span of 76.2 m (250 ft). Interior surfaces are sheathed with polychrome marbles, green and white with purple porphyry, and gold mosaics. The exterior, clad in stucco, was tinted yellow and red during restorations in the 19th century at the direction of the Fossati architects. The Imperial Gate was the main entrance between the exo- and esonarthex. It was reserved exclusively for the Emperor. The Byzantine mosaic above the portal depicts Christ and an unnamed emperor. A long ramp from the northern part of the outer narthex leads up to the upper gallery. Throughout history the Hagia Sophia has been a victim to natural disasters, such as earthquakes, and has also fallen victim to vandalism. Structural damage can easily be seen on its exterior surface. To ensure that the Hagia Sophia did not ensue any damage on the interior of the building, studies have been conducted using ground penetrating radar within the gallery of the Hagia Sophia. With the use of GPR (ground penetrating radar), teams discovered weak zones within the Hagia Sophia's gallery and also concluded that the curvature of the vault dome has been shifted out of proportion, compared to its original angular orientation. The upper gallery contains runic graffiti presumed to be from the Varangian Guard. View upward to domes (annotations). The dome of Hagia Sophia has spurred particular interest for many art historians, architects and engineers because of the innovative way the original architects envisioned it. The dome is carried on four spherical triangular pendentives, one of the first large-scale uses of them. The pendentives are the corners of the square base of the dome, which curve upwards into the dome to support it, restraining the lateral forces of the dome and allowing its weight to flow downwards. It was the largest pendentive dome in the world until the completion of St. Peter's Basilica, and has a much lower height than any other dome of such a large diameter. The great dome at the Hagia Sophia is one hundred and seven feet in diameter and is only two feet thick. The main building material for the Hagia Sophia composed of brick and mortar. Brick aggregate was used to make roofs easier to construct. The aggregate weighs one hundred and fifty pounds per cubic foot, an average weight of masonry construction at the time. Due to the materials plasticity it was chosen over cut stone due to the fact that aggregate can be used over a longer distance. The weight of the dome remained a problem for most of the building's existence. The original cupola collapsed entirely after the earthquake of 558; in 563 a new dome was built by Isidore the younger, a nephew of Isidore of Miletus. Unlike the original, this included 40 ribs and was raised 20 feet, in order to lower the lateral forces on the church walls. A larger section of the second dome collapsed as well, in two episodes, so that today only two sections of the present dome, in the north and south side, still date from the 562 reconstructions. Of the whole dome's 40 ribs, the surviving north section contains eight ribs, while the south section includes six ribs. Although this design stabilizes the dome and the surrounding walls and arches, the actual construction of the walls of Hagia Sophia weakened the overall structure. The bricklayers used more mortar than brick, which is more effective if the mortar was allowed to settle as the building would have been more flexible; however, the builders raced to complete the building and left no time for the mortar to cure before they began the next layer. When the dome was erected, its weight caused the walls to lean outward because of the wet mortar underneath. When Isidore the Younger rebuilt the fallen cupola, he had first to build up the interior of the walls to make them vertical again. Additionally, the architect raised the height of the rebuilt dome by approximately six m (20 feet) so that the lateral forces would not be as strong and its weight would be transmitted more effectively down into the walls. Moreover, he shaped the new cupola like a scalloped shell or the inside of an umbrella, with ribs that extend from the top down to the base. These ribs allow the weight of the dome to flow between the windows, down the pendentives, and ultimately to the foundation. Hagia Sophia is famous for the light that reflects everywhere in the interior of the nave, giving the dome the appearance of hovering above. This effect was achieved by inserting forty windows around the base of the original structure. Moreover, the insertion of the windows in the dome structure lowers its weight. The minarets were an Ottoman addition and not part of the original church's Byzantine design. They were built for notification of invitations for prayers and announcements. Mehmed had built a minaret made from wood over one of the half domes soon after Hagia Sophia's conversion from a cathedral to a mosque. This minaret does not exist today. One of the minarets (at southeast) was built from red brick and can be dated back from the Fatih Sultan Mehmed period or Beyazıd II period. The other three were built from white limestone and sandstone, of which the slender northeast column was erected by Sultan Bayezid II during the Selim II period, while the two identical larger minarets to the west were erected by Sultan Selim II and designed by the famous Ottoman architect Mimar Sinan. Both are 60 metres in height, and with their thick and massif patterns, complete Hagia Sophia's main structure. Many ornaments and details were added to these minarets on repairs during the 15th, 16th, and 19th centuries, which reflect each period's characteristics and ideals. Numerous buttresses have been added throughout the centuries. The flying buttresses to the west of the building, although thought to have been constructed by the Crusaders upon their visit to Constantinople, are actually built during the Byzantine era. This shows that the Byzantines had prior knowledge of flying buttresses which can also be seen at Hosios Loukas in Central Greece, the Rotunda of Galerius in Thessaloniki, and San Vitale in Ravenna. Other buttresses were constructed during the Ottoman times under the guidance of the architect Sinan. A total of 24 buttresses were added. Originally, under Justinian's reign, the interior decorations consisted of abstract designs on marble slabs on the walls and floors, as well as mosaics on the curving vaults. Of these mosaics, one can still see the two archangels Gabriel and Michael in the spandrels of the bema. There were already a few figurative decorations, as attested by the eulogy of Paul the Silentiary. The spandrels (corners) of the gallery are faced in inlaid thin slabs (opus sectile), showing patterns and figures of flowers and birds in precisely cut pieces of white marble set against a background of black marble. In later stages, figurative mosaics were added, which were destroyed during the iconoclastic controversy (726–843). Present mosaics are from the post-iconoclastic period. Apart from the mosaics, a large number of figurative decorations were added during the second half of the 9th century: an image of Christ in the central dome; Orthodox saints, prophets and Church Fathers in the tympana below; historical figures connected with this church, such as Patriarch Ignatius; some scenes from the gospel in the galleries. Basil II let artists paint on each of the four pendentives a giant six-winged cherub. The Ottomans covered their face with a golden halo, but in 2009 one of them was restored to the original state. The Loggia of the Empress is located in the centre of the upper enclosure, or gallery, of the Hagia Sophia. From there the empress and the court-ladies would watch the proceedings down below. A round green stone marks the spot where the throne of the empress stood. Two huge marble lustration (ritual purification) urns were brought from Pergamon during the reign of Sultan Murad III. From the Hellenistic period, they are carved from single blocks of marble. The Marble Door inside the Hagia Sophia is located in the southern upper enclosure or gallery. It was used by the participants in synods, who entered and left the meeting chamber through this door. It is said[by whom?] that each side is symbolic and that one side represents heaven while the other represents hell. Its panels are covered in fruits and fish motives. The door opens into a space that was used as a venue for solemn meetings and important resolutions of patriarchate officials. The Nice Door is the oldest architectural element found in the Hagia Sophia dating back to the 2nd century BC. The decorations are of reliefs of geometric shapes as well as plants that are believed to have come from a pagan temple in Tarsus, Mersin now modern-day Turkey. It was incorporated into the building by Emperor Theophilos in 838 where it is placed in the south exit in the inner narthex. The Emperor Door is the door that would be used solely by the Emperor as well as his personal bodyguard and retinue. It is the largest door in the Hagia Sophia and has been dated to the 6th century. It is about 7 meters long and Eastern Roman sources say it was made with wood from Noah's Ark. At the northwest of the building, there is a column with a hole in the middle covered by bronze plates. This column goes by different names; the perspiring column, the wishing column, the sweating column or the crying column. The column is said to be damp when touched and have supernatural powers. The legend states that since St. Gregory the Miracle Worker appeared near the column in the year 1200, it has been moist. It is believed that touching the moisture cures many illnesses. The first mosaics which adorned the church were only completed during the reign of Justin II. Many of the non-figurative mosaics in the church come from this period. Most of the mosaics, however, were completed after the end of the periods of Byzantine Iconoclasm in 843. During the Sack of Constantinople in 1204, the Latin Crusaders vandalized valuable items in every important Byzantine structure of the city, including the golden mosaics of the Hagia Sophia. Many of these items were shipped to Venice, whose Doge, Enrico Dandolo, had organized the invasion and sack of Constantinople after an agreement with Prince Alexios Angelos, the son of a deposed Byzantine emperor. Following the building's conversion into a mosque in 1453, many of its mosaics were covered with plaster, due to Islam's ban on representational imagery. This process was not completed at once, and reports exist from the 17th century in which travelers note that they could still see Christian images in the former church. In 1847–1849, the building was restored by two Swiss-Italian Fossati brothers, Gaspare and Giuseppe, and Sultan Abdülmecid allowed them to also document any mosaics they might discover during this process which were later archived in Swiss libraries. This work did not include repairing the mosaics and after recording the details about an image, the Fossatis painted it over again. The Fossatis restored the mosaics of the two hexapteryga (singular Greek: ἑεξαπτέρυγον, pr. hexapterygon, six-winged angel; it is uncertain whether they are seraphim or cherubim) located on the two east pendentives, covering their faces again before the end of the restoration. The other two placed on the west pendentives are copies in paint created by the Fossatis since they could find no surviving remains of them. As in this case, the architects reproduced in paint damaged decorative mosaic patterns, sometimes redesigning them in the process. The Fossati records are the primary sources about a number of mosaic images now believed to have been completely or partially destroyed in the 1894 Istanbul earthquake. These include a mosaic over a now-unidentified Door of the Poor, a large image of a jewel-encrusted cross, and a large number of images of angels, saints, patriarchs, and church fathers. Most of the missing images were located in the building's two tympana. One mosaic they documented is Christ Pantocrator in a circle, which would indicate it to be a ceiling mosaic, possibly even of the main dome which was later covered and painted over with Islamic calligraphy that expounds God as the light of the universe. The drawings of the Hagia Sophia mosaics are today kept in the Cantonal Archive of Ticino. A large number of mosaics were uncovered in the 1930s by a team from the Byzantine Institute of America led by Thomas Whittemore. The team chose to let a number of simple cross images remain covered by plaster but uncovered all major mosaics found. In 2000, The National Technical University of Athens has begun to use Non Destructive Techniques along with infrared technology to scan walls of the Hagia Sophia to locate mosaics that have been previously covered with plaster. The National Technical University of Athens is using infrared technology, to assess the damage mosaics have taken within the Hagia Sophia beneath the plaster. The National Technical University of Athens uses categories such as water intrusion to determine a mosaics current state of condition. Because of its long history as both a church and a mosque, a particular challenge arises in the restoration process. Christian iconographic mosaics can be uncovered, but often at the expense of important and historic Islamic art. Restorers have attempted to maintain a balance between both Christian and Islamic cultures. In particular, much controversy rests upon whether the Islamic calligraphy on the dome of the cathedral should be removed, in order to permit the underlying Pantocrator mosaic of Christ as Master of the World, to be exhibited (assuming the mosaic still exists). The Hagia Sophia has been a victim to natural disasters that have caused deterioration to the buildings structure and walls. The deterioration of the Hagia Sophia's walls can be directly relate to salt crystallization. The crystallization of salt is due to an intrusion of rainwater that is at fault for the Hagia Sophia's deteriorating inner and outer walls. Diverting excess rainwater is the main solution to solve the deteriorating walls at the Hagia Sophia. Built between 532–537 a subsurface structure under the Hagia Sophia has been under investigation, using LaCoste-Romberg gravimeters to determine the depth of the subsurface structure and to discover other hidden cavities beneath the Hagia Sophia. The hidden cavities have also acted as a support system against earthquakes. With these findings using the LaCoste-Romberg gravimeters, it was also discovered that the Hagia Sophia's foundation is built on a slope of natural rock. The Imperial Gate mosaic is located in the tympanum above that gate, which was used only by the emperors when entering the church. Based on style analysis, it has been dated to the late 9th or early 10th century. The emperor with a nimbus or halo could possibly represent emperor Leo VI the Wise or his son Constantine VII Porphyrogenitus bowing down before Christ Pantocrator, seated on a jeweled throne, giving His blessing and holding in His left hand an open book. The text on the book reads as follows: "Peace be with you. I am the light of the world". (John 20:19; 20:26; 8:12) On each side of Christ's shoulders is a circular medallion: on His left the Archangel Gabriel, holding a staff, on His right His Mother Mary. The southwestern entrance mosaic, situated in the tympanum of the southwestern entrance, dates from the reign of Basil II. It was rediscovered during the restorations of 1849 by the Fossatis. The Virgin sits on a throne without a back, her feet resting on a pedestal, embellished with precious stones. The Child Christ sits on her lap, giving His blessing and holding a scroll in His left hand. On her left side stands emperor Constantine in ceremonial attire, presenting a model of the city to Mary. The inscription next to him says: "Great emperor Constantine of the Saints". On her right side stands emperor Justinian I, offering a model of the Hagia Sophia. The medallions on both sides of the Virgin's head carry the monograms MP and ΘΥ, an abbreviation of "Mētēr" and "Theou", meaning "Mother of God". The Virgin and Child mosaic was the first of the post-iconoclastic mosaics. It was inaugurated on 29 March 867 by Patriarch Photius and the emperors Michael III and Basil I. This mosaic is situated in a high location on the half dome of the apse. Mary is sitting on a throne without a back, holding the Child Jesus on her lap. Her feet rest on a pedestal. Both the pedestal and the throne are adorned with precious stones. The portraits of the archangels Gabriel and Michael (largely destroyed) in the bema of the arch also date from the 9th century. The mosaics are set against the original golden background of the 6th century. These mosaics were believed to be a reconstruction of the mosaics of the 6th century that were previously destroyed during the iconoclastic era by the Byzantines of that time, as represented in the inaugural sermon by the patriarch Photios. However, no record of figurative decoration of Hagia Sophia exists before this time. The Emperor Alexander mosaic is not easy to find for the first-time visitor, located on the second floor in a dark corner of the ceiling. It depicts Emperor Alexander in full regalia, holding a scroll in his right hand and a globus cruciger in his left. A drawing by the Fossatis showed that the mosaic survived until 1849 and that Thomas Whittemore, founder of the Byzantine Institute of America who was granted permission to preserve the mosaics, assumed that it had been destroyed in the earthquake of 1894. Eight years after his death, the mosaic was discovered in 1958 largely through the researches of Robert Van Nice. Unlike most of the other mosaics in Hagia Sophia, which had been covered over by ordinary plaster, the Alexander mosaic was simply painted over and reflected the surrounding mosaic patterns and thus was well hidden. It was duly cleaned by the Byzantine Institute's successor to Whittemore, Paul A. Underwood. The Empress Zoe mosaic on the eastern wall of the southern gallery date from the 11th century. Christ Pantocrator, clad in the dark blue robe (as is the custom in Byzantine art), is seated in the middle against a golden background, giving His blessing with the right hand and holding the Bible in His left hand. On either side of His head are the monograms IC and XC, meaning Iēsous Christos. He is flanked by Constantine IX Monomachus and Empress Zoe, both in ceremonial costumes. He is offering a purse, as a symbol of donation, he made to the church, while she is holding a scroll, symbol of the donations she made. The inscription over the head of the emperor says: "Constantine, pious emperor in Christ the God, king of the Romans, Monomachus". The inscription over the head of the empress reads as follows: "Zoë, the very pious Augusta". The previous heads have been scraped off and replaced by the three present ones. Perhaps the earlier mosaic showed her first husband Romanus III Argyrus or her second husband Michael IV. Another theory is that this mosaic was made for an earlier emperor and empress, with their heads changed into the present ones. The Comnenus mosaic, also located on the eastern wall of the southern gallery, dates from 1122. The Virgin Mary is standing in the middle, depicted, as usual in Byzantine art, in a dark blue gown. She holds the Child Christ on her lap. He gives His blessing with His right hand while holding a scroll in His left hand. On her right side stands emperor John II Comnenus, represented in a garb embellished with precious stones. He holds a purse, symbol of an imperial donation to the church. Empress Irene stands on the left side of the Virgin, wearing ceremonial garments and offering a document. Their eldest son Alexius Comnenus is represented on an adjacent pilaster. He is shown as a beardless youth, probably representing his appearance at his coronation aged seventeen. In this panel, one can already see a difference with the Empress Zoe mosaic that is one century older. There is a more realistic expression in the portraits instead of an idealized representation. The Empress, Saint Irene (born Piroska), daughter of Ladislaus I of Hungary is shown with plaited blond hair, rosy cheeks, and grey eyes, revealing her Hungarian descent. The emperor is depicted in a dignified manner. The Deësis mosaic (Δέησις, "Entreaty") probably dates from 1261. It was commissioned to mark the end of 57 years of Roman Catholic use and the return to the Orthodox faith. It is the third panel situated in the imperial enclosure of the upper galleries. It is widely considered the finest in Hagia Sophia, because of the softness of the features, the humane expressions and the tones of the mosaic. The style is close to that of the Italian painters of the late 13th or early 14th century, such as Duccio. In this panel the Virgin Mary and John the Baptist (Ioannes Prodromos), both shown in three-quarters profile, are imploring the intercession of Christ Pantocrator for humanity on Judgment Day. The bottom part of this mosaic is badly deteriorated. This mosaic is considered as the beginning of the Renaissance in Byzantine pictorial art. The northern tympanum mosaics feature various saints. They have been able to survive due to the very high and unreachable location. They depict Saints John Chrysostom and Ignatius the Younger standing, clothed in white robes with crosses, and holding richly jeweled Holy Bibles. The names of each saint are given around the figures in Greek, in order to enable an identification for the visitor. The other mosaics in the other tympana have not survived probably due to the frequent earthquakes as opposed to any deliberate destruction by the Ottoman conquerors. This features four unidentical angel figures. It is believed that these on headed six winged angels, also known as seraphim, protect the lords throne in heaven. There are angels in the east composed in mosaics as where the ones in the west were damaged during the Eastern Roman Period, they have been renewed as fresco. During the ottoman period the angels faces were covered with metallic lids in the shape of stars, but were removed to reveal the faces in 2009 during renovations. Detail of relief on the Marble Door. Interior view of the Hagia Sophia, showing Islamic elements on the top of the main dome (annotations). Hagia Sophia during its time as a mosque. Illustration by Gaspare Fossati and Louis Haghe from 1852. Interior panorama of the Hagia Sophia (annotations). Circa 1900 photograph, from its time as a mosque. The face of the Hexapterygon (six-winged angel) on the northeast pendentive (upper left), discovered but covered again by Gaspare Fossati during its restoration, is visible again (annotations). Many religious structures have been modeled on the Hagia Sophia's core structure of a large central dome resting on pendentives and buttressed by two semi-domes. A notable Venetian example is the High Altar of Santa Maria della Salute. Several mosques commissioned by the Ottoman dynasty closely mimic the geometry of the Hagia Sophia, including the Süleymaniye Mosque and the Bayezid II Mosque. In many cases, Ottoman architects preferred to surround the central dome with four semi-domes rather than two. This is true in the Sultan Ahmed Mosque, the New Mosque (Istanbul), and the Fatih Mosque. Like the original plan of the Hagia Sophia, many of these mosques are also entered through a colonnaded courtyard. However, the courtyard of the Hagia Sophia no longer exists. Many Neo-Byzantine churches are modeled on the Hagia Sophia. The Kronstadt Naval Cathedral and Poti Cathedral closely replicate the internal geometry of the Hagia Sophia. The interior of the Kronstadt Naval Cathedral is a nearly 1-to-1 copy of the Hagia Sophia. The marble revetment also closely mimics the source work. Like Ottoman mosques, many churches based on the Hagia Sophia include four semi-domes rather than two, such as the Church of Saint Sava in Belgrade. Several churches combine the layout of the Hagia Sophia with a Latin cross plan. For instance, the Cathedral Basilica of Saint Louis (St. Louis), where the transept is formed by two semi-domes surrounding the main dome. This church also closely emulates the column capitals and mosaic styles of the Hagia Sophia. Other similar examples include the Alexander Nevsky Cathedral, Sofia, Saint Clement Catholic Church, Chicago, and Basilica of the National Shrine of the Immaculate Conception. The Catedral Metropolitana Ortodoxa in São Paulo and the Église du Saint-Esprit (Paris) closely follow the interior layout of the Hagia Sophia. Both include four semi-domes, but the two lateral semi-domes are very shallow. In terms of size, the Église du Saint-Esprit is about two thirds the scale of the Hagia Sophia. Synagogues based on the Hagia Sophia include the Congregation Emanu-El (San Francisco), Great Synagogue of Florence, and Hurva Synagogue. ^ a b c Fazio, Michael; Moffett, Marian; Wodehouse, Lawrence (2009). Buildings Across Time (3rd ed.). McGraw-Hill Higher Education. ISBN 978-0-07-305304-2. ^ Simons, Marlise (22 August 1993). "Center of Ottoman Power". The New York Times. Retrieved 4 June 2009. ^ Syrmakezis, K.; Mavrouli, O.; Papaevaggeliou, P.; Aggelakopolulou, E.; Bakolas, A.; Moropoulou, A. (November 2013). "Finite element analysis and fragility curves for the evaluation of restoration mortars behavior regarding the earthquake protection of historic structures". Soil Dynamics and Earthquake Engineering. 54: 61–65. doi:10.1016/j.soildyn.2013.07.002. ISSN 0267-7261. ^ Kleiner, Fred S.; Christin J. Mamiya (2008). Gardner's Art Through the Ages: Volume I, Chapters 1–18 (12th ed.). Mason, OH: Wadsworth. p. 329. ISBN 978-0-495-46740-3. ^ McKenzie, Steven L.; Graham, Matt Patrick (1998). The Hebrew Bible Today: An Introduction to Critical Issues. Westminster John Knox Press. p. 149. ISBN 978-0-664-25652-4. ^ Binns, John (2002). An Introduction to the Christian Orthodox Churches. Cambridge University Press. p. 57. ISBN 978-0-521-66738-8. 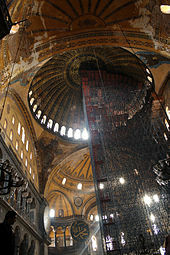 ^ "Hagia Sophia Archived 5 January 2009 at the Wayback Machine." ArchNet. ^ a b "Top 10: Turkey's most visited museums". Hürriyet Daily News. 10 November 2014. ^ Hagia Sophia might be reverted to a mosque. ^ Alessandro E. Foni; George Papagiannakis; Nadia Magnentat-Thalmann. "Virtual Hagia Sophia: Restitution, Visualization and Virtual Life Simulation" (PDF). Archived from the original (PDF) on 9 July 2007. Retrieved 3 July 2007. ^ Krautheimer, Richard (1986). Early Christian and Byzantine Architecture (4th ed.). New Haven and London: Yale University Press/Pelican History of Art. p. 205. ISBN 978-0-300-05296-1. ^ Mango, Cyril (1985). Byzantine Architecture (1st ed.). New York: Electa/Rizzoli. p. 65. ISBN 978-0-8478-0615-7. ^ a b c d e Müller-Wiener (1977), p. 86. ^ "The Chronicle of Theophones Confessor: Byzantine and Near Eastern History AD 284–813." Translated with commentary by Cyril Mango and Roger Scott. AM 6030 p. 316, with this note: Theophanes' precise date should be accepted. ^ Janin, Raymond (1950). Constantinople Byzantine (in French) (1 ed.). Paris: Institut Français d'Etudes Byzantines. p. 41. ^ "Haghia Sophia". Istanbul /: Emporis. Retrieved 4 December 2011. ^ "Baalbek keeps its secrets". stoneworld. ^ Maranci, Christina (September 2003). "The Architect Trdat: Building Practices and Cross-Cultural Exchange in Byzantium and Armenia". Journal of the Society of Architectural Historians. 62 (3): 294–305. doi:10.2307/3592516. JSTOR 3592516. ^ Müller-Wiener (1977), p. 87. ^ Gallo, Rudolfo (1927). 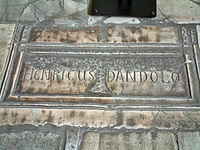 "La tomba di Enrico Dandolo in Santa Sofia a Constantinople". Rivista Mensile della Citta di Venezia. 6: 270–83. ^ a b c d e f g h i j k l m n o Müller-Wiener (1977), p. 91. ^ Runciman, Steven (1965). The Fall of Constantinople, 1453. Cambridge: Cambridge University Press. p. 145. ISBN 978-0-521-39832-9. ^ Runciman. The Fall of Constantinople, pp. 133–34. ^ Tafur, Pero (1926). Travels and Adventures, 1435–1439. Trans. M. Letts. London: G. Routledge. pp. 138–48. ^ Mungan, I. (2004). Hagia Sophia and Mimar Sinan. Mungan & Wittek (eds); Taylor & Francis Group, London. pp. 383–84. ISBN 978-90-5809-642-5. ^ Turkish Cultural Foundation. The Fossati brothers. ^ Grove Encyclopedia of Islamic Art & Architecture: Istanbul, Oxford University Press, p. 324. ^ "World Monuments Fund – Hagia Sophia". Wmf.org. Retrieved 4 December 2011. ^ "Ýstanbul Tanýtýmý – Ayasofya Müzesi". Istanbul.gov.tr. Archived from the original on 24 January 2012. Retrieved 4 December 2011. ^ "Ayasofya'da ezan okunuyor, duydunuz mu?". Timeturk. Retrieved 16 July 2013. ^ "Group unveils initiative on Hagia Sophia". HomeboyMediaNews. 16 June 2007. ^ Константинопольская София – мать всех церквей) Православие.Ru, 29 October 2007. ^ "Call to reinstate Hagia Sophia as mosque". Financial Times. 15 November 2013. Retrieved 24 December 2013. ^ "Greece angered over Turkish Deputy PM's Hagia Sophia remarks". Hürriyet. 19 November 2013. Retrieved 20 November 2013. ^ "Turkey: Pressure mounts for Hagia Sophia to be converted into mosque". Christian Today. 13 December 2013. Retrieved 24 December 2013. ^ "Pope's remarks 'to accelerate Hagia Sophia's conversion into mosque'". Hurriyet. 16 April 2015. ^ Moftah, Lora (16 April 2015). "Hagia Sophia Mosque Conversion? Turkey Pope Backlash Could Open Historic Church To Muslim Worship". International Business Times. ^ "First call to prayer inside Istanbul's Hagia Sophia in 85 years". hurriyet. ^ "Muslim group prays in front of Hagia Sophia to demand re-conversion into mosque". hurriyet. ^ "Turkey rejects Greek criticism of Hagia Sophia prayers". hurriyet. ^ "Hagia Sophia's status to be changed to mosque: Erdoğan". hurriyet. ^ "Hagia Sophia: Controversy as Erdogan says museum and former cathedral will become a mosque". euronews. ^ "UNESCO "halts" Erdogan's plans to turn the Hagia Sophia into Mosque". dailyhellas.com. 27 March 2019. Retrieved 10 April 2019. ^ Kinross, Lord (1972). Hagia Sophia. S. Arthur Dembner. pp. 30, 35, 45, 80. ISBN 978-0882250144. ^ "Erdogan again suggests converting Hagia Sophia into mosque". ^ Melton, J. Gordon; Baumann, Martin (2010). Religions of the World: A Comprehensive Encyclopedia of Beliefs and Practices. ABC-CLIO. p. 513. ^ Yalçıner, Cahit Çağlar; Kurban, Yunus Can; Altunel, Erhan (May 2017). "Research using GPR into the cause of cracks and depressions in the floor of the gallery of Hagia Sophia Museum". Construction and Building Materials. 139: 458–66. doi:10.1016/j.conbuildmat.2017.02.036. ISSN 0950-0618. ^ Kleiner and Mamiya. Gardner's Art Through the Ages, p. 331. ^ "pendentive (architecture) – Britannica Online Encyclopedia". Britannica.com. Retrieved 4 December 2011. ^ MacDonald, William (1957). "Design and Technology in Hagia Sophia". Perspecta. 4: 20–27. doi:10.2307/1566853. ISSN 0079-0958. JSTOR 1566853. ^ Mainstone, Rowland J. (2001). Hagia Sophia. London: Thames & Hudson. pp. 90–93. ISBN 978-0-500-27945-8. ^ a b c Mainstone, R.J. (Rowland J.) (1988). Hagia Sophia : architecture, structure, and liturgy of Justinian's great church. New York: Thames and Hudson. ISBN 978-0500340981. OCLC 15378795. ^ Hagia Sophia. "Mosque". Archived from the original on 28 January 2013. Retrieved 26 February 2013. ^ "Minarets | Hagia Sophia Museum". ^ "Buttresses | Hagia Sophia Museum". ayasofyamuzesi.gov.tr. Directorate of Hagia Sophia Museum. Retrieved 18 April 2017. ^ "Hagia Sophia: Facts, History & Architecture". Live Science. Retrieved 12 June 2017. ^ Istanbul City Guide (English). ASBOOK. 2009. ^ "The Marble Door." The Marble Door | Hagia Sophia Museum, ayasofyamuzesi.gov.tr/en/door-marble-door. ^ "Ayasofya Müzesi". Ayasofyamuzesi.gov.tr. Archived from the original on 4 November 2013. Retrieved 3 November 2013. ^ "Aya Sofya or Hagia Sophia Mosque-Church and Museum". Very Turkey. ^ N., Patricios, Nicholas (27 March 2014). The sacred architecture of Byzantium : art, liturgy and symbolism in early Christian churches. London. ISBN 978-1780762913. OCLC 879616183. ^ "Monuments éternels". Programmes ARTE. 21 September 2014. Archived from the original on 5 May 2015. ^ Menegaki, Maria; Benardos, Andreas; Damigos, Dimitris; Kaliampakos, Dimitris; Tsakalakis, Kostas (18 September 2017). "Emphasizing the Role of E-waste in the Financial Profitability of Landfill Mining Projects". Matter: International Journal of Science and Technology. 3 (2): 122–44. doi:10.20319/mijst.2017.32.122144. ISSN 2454-5880. ^ Mizutani, Etsuko; Ogura, Daisuke; Ishizaki, Takeshi; Abuku, Masaru; Sasaki, Juni (1 November 2015). "Influence of the Infiltrated Rainwater on the Degradation of the Inner Wall in Hagia Sophia, Istanbul". Energy Procedia. 78: 1353–58. doi:10.1016/j.egypro.2015.11.153. ISSN 1876-6102. ^ Friedrich, Jürgen; Gerstenecker, Carl; Gürkan, Onur (October 1996). "Gravimetric examination of Hagia Sophia's subsurface structure". Journal of Geodesy. 70 (10): 645–51. doi:10.1007/bf00868226. ISSN 0949-7714. ^ "The Hagia Sophia Church". Guideistanbul.net. Retrieved 4 December 2011. ^ Hagia Sophia. "Imperial Door Mosaic". hagiasophia.com. Archived from the original on 7 January 2019. Retrieved 27 January 2019. ^ Lorenzo Riccardi, Observations on Basil II as Patron of the Arts, in Actual Problems of Theory and History of Art, I, Collection of articles. Materials of the Conference of Young Specialists (St. Petersburg State University, 1–5 December 2010), St. Petersburg 2011 (ISBN 978-5-288-05174-6), pp. 39–45; Lorenzo Riccardi, Alcune riflessioni sul mosaico del vestibolo sud-ovest della Santa Sofia di Costantinopoli, in Vie per Bisanzio. VIII Congresso Nazionale dell'Associazione Italiana di Studi Bizantini (Venezia 25–28 novembre 2009), a cura di Antonio Rigo, Andrea Babuin e Michele Trizio, Bari, Edizioni di Pagina 2012 (ISBN 978-88-7470-229-9), pp. 357–71. ^ Hagia Sophia. "Southwestern Vestibule". hagiasophia.com. Archived from the original on 20 December 2018. Retrieved 27 January 2019. ^ Hagia Sophia. "Apse Mosaic". hagiasophia.com. Archived from the original on 20 December 2018. Retrieved 27 January 2019. ^ Lord Kinross. "Hagia Sophia: A History of Constantinople." Newsweek, 1972, pp. 132–33. ^ Hagia Sophia. "Emperor Alexander". hagiasophia.com. Archived from the original on 20 December 2018. Retrieved 27 January 2019. ^ Hagia Sophia. "Empress Zoe". hagiasophia.com. Archived from the original on 20 December 2018. Retrieved 27 January 2019. ^ Hagia Sophia. "Comnenus". hagiasophia.com. Archived from the original on 20 December 2018. Retrieved 27 January 2019. ^ Parry, K., The Blackwell Companion to Eastern Christianity, John Wiley & Sons, 2010. p. 379. ^ Hagia Sophia. "Deesis". hagiasophia.com. Archived from the original on 20 December 2018. Retrieved 27 January 2019. ^ Hagia Sophia. "North Tympanum". hagiasophia.com. Archived from the original on 20 December 2018. Retrieved 27 January 2019. ^ "Dome Angel Figures". Hagia Sophia Museum. Boyran, Ebru; Fleet, Kate (2010). A social History of Ottoman Istanbul. Cambridge: Cambridge University Press. ISBN 978-0-521-19955-1. Brubaker, Leslie; Haldon, John (2011). Byzantium in the Iconoclast era (ca 680–850). Cambridge: Cambridge University Press. ISBN 978-0-521-43093-7. Hagia Sophia Church[dead link], also known as Church of Holy Wisdom. Hagia Sophia. . Accessed 23 Sept 2014. Hoffman, Volker (1999). Die Hagia Sophia in Istanbul (in German). Bern: Lang. ISBN 978-3-906762-81-4. Janin, Raymond (1953). La Géographie Ecclésiastique de l'Empire Byzantin. 1. Part: Le Siège de Constantinople et le Patriarcat Oecuménique. 3rd Vol. : Les Églises et les Monastères. Paris: Institut Français d'Etudes Byzantines. Mainstone, Rowland J. (1997). Hagia Sophia: Architecture, Structure, and Liturgy of Justinian's Great Church (reprint edition). W.W. Norton & Co. ISBN 978-0-500-27945-8. .
Müller-Wiener, Wolfgang (1977). 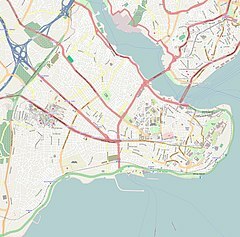 Bildlexikon zur Topographie Istanbuls: Byzantion, Konstantinupolis, Istanbul bis zum Beginn d. 17 Jh (in German). Tübingen: Wasmuth. ISBN 978-3-8030-1022-3. Necipoĝlu, Gulru (2005). The Age of Sinan: Architectural Culture in the Ottoman Empire. London: Reaktion Books. ISBN 978-1-86189-244-7. Ronchey, Silvia; Braccini, Tommaso (2010). Il romanzo di Costantinopoli. Guida letteraria alla Roma d'Oriente (in Italian). Torino: Einaudi. ISBN 978-88-06-18921-1. Runciman, Steven (1965). The Fall of Constantinople, 1453. Cambridge: Cambridge University Press. p. 145. ISBN 0-521-39832-0. Savignac, David. "The Medieval Russian Account of the Fourth Crusade – A New Annotated Translation". Turner, J. (1996). Grove Dictionary of Art. Oxford: Oxford University Press. ISBN 978-0-19-517068-9. Alchermes, Joseph D. (2005). "Art and Architecture in the Age of Justinian". In Maas, Michael (ed.). The Cambridge Companion to the Age of Justinian. Cambridge: Cambridge U.P. pp. 343–75. ISBN 978-0-521-52071-3. Balfour, John Patrick Douglas (1972). Hagia Sophia. W.W. Norton & Company. ISBN 978-0-88225-014-4. Cimok, Fatih (2004). Hagia Sophia. Milet Publishing Ltd. ISBN 978-975-7199-61-8. Doumato, Lamia (1980). The Byzantine church of Hagia Sophia: Selected references. Vance Bibliographies. ASIN B0006E2O2M. Goriansky, Lev Vladimir (1933). Haghia Sophia: analysis of the architecture, art and spirit behind the shrine in Constantinople dedicated to Hagia Sophia. American School of Philosophy. ASIN B0008C47EA. Howland Swift, Emerson (1937). The bronze doors of the gate of the horologium at Hagia Sophia. University of Chicago. ASIN B000889GIG. Kahler, Heinz (1967). Haghia Sophia. Praeger. ASIN B0008C47EA. Kinross, Lord (1972). Hagia Sophia, Wonders of Man. Newsweek. ASIN B000K5QN9W. Kleinbauer, W. Eugene; Anthony White (2007). Hagia Sophia. London: Scala Publishers. ISBN 978-1-85759-308-2. Kleinbauer, W. Eugene (2000). Saint Sophia at Constantinople: Singulariter in Mundo (Monograph (Frederic Lindley Morgan Chair of Architectural Design), No. 5.). William L. Bauhan. ISBN 978-0-87233-123-5. Krautheimer, Richard (1984). Early Christian and Byzantine Architecture. New Haven, CT: Yale University Press. ISBN 978-0-300-05294-7. Mainstone, R.J. (1997). Hagia Sophia: Architecture, Structure, and Liturgy of Justinian's Great Church. London: Thames & Hudson. ISBN 978-0-500-27945-8. Mainstone, Rowland J. (1988). Hagia Sophia. Architecture, structure and liturgy of Justinian's great church. London: Thames & Hudson. ISBN 978-0-500-34098-1. Mango, Cyril; Ahmed Ertuğ (1997). Hagia Sophia. A vision for empires. Istanbul. Mark, R.; Çakmaktitle, AS. (1992). Hagia Sophia from the Age of Justinian to the Present. Princeton Architectural. ISBN 978-1-878271-11-2. Nelson, Robert S. (2004). Hagia Sophia, 1850–1950: Holy Wisdom Modern Monument. Chicago: University Of Chicago Press. ISBN 978-0-226-57171-3. Özkul, T.A. (2007). Structural characteristics of Hagia Sophia: I-A finite element formulation for static analysis. Elsevier. Swainson, Harold (2005). The Church of Sancta Sophia Constantinople: A Study of Byzantine Building. Boston, MA: Adamant Media Corporation. ISBN 978-1-4021-8345-4. Yucel, Erdem (2005). Hagia Sophia. Scala Publishers. ISBN 978-1-85759-250-4. MacDonald, William Lloyd (1951). The uncovering of Byzantine mosaics in Hagia Sophia. Archaeological Institute of America. ASIN B0007GZTKS. Mango, Cyril (1972). The mosaics of St. Sophia at Istanbul: The church fathers in the north Tympanum. Dumbarton Oaks Center for Byzantine Studies. ASIN B0007CAVA0. Mango, Cyril (1968). The Apse mosaics of St. Sophia at Istanbul: Report on work carried out in 1964. Johnson Reprints. ASIN B0007G5RBY. Mango, Cyril; Heinz Kahler (1967). Hagia Sophia: With a Chapter on the Mosaics. Praeger. ASIN B0000CO5IL. Teteriatnikov, Natalia B. (1998). Mosaics of Hagia Sophia, Istanbul: The Fossati Restoration and the Work of the Byzantine Institute. Dumbarton Oaks Research Library and Collection. ISBN 978-0-88402-264-0. Riccardi, Lorenzo (2012). Alcune riflessioni sul mosaico del vestibolo sud-ovest della Santa Sofia di Costantinopoli, in Vie per Bisanzio. VIII Congresso Nazionale dell'Associazione Italiana di Studi Bizantini (Venezia 25–28 novembre 2009), a cura di Antonio Rigo, Andrea Babuin e Michele Trizio. Bari. pp. 357–71. ISBN 978-88-7470-229-9. Retrieved 30 September 2014. Yücel, Erdem (1988). The mosaics of Hagia Sophia. Efe Turizm. ASIN B0007CBGYA. Wikisource has the text of a 1905 New International Encyclopedia article about Hagia Sophia. This page was last edited on 23 April 2019, at 20:48 (UTC).